At last an evening with uninterrupted good transparency and no moon arrives, though it was well past 10pm before the cloud finally relented. 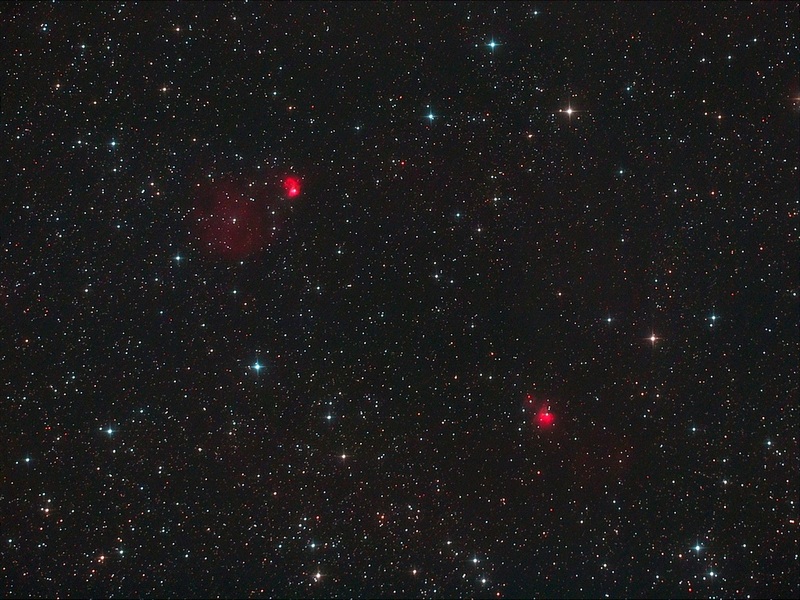 I had noticed this pair of small bright nebula in Cepheus some time ago and decided to image them with the Newtonian when conditions were right. 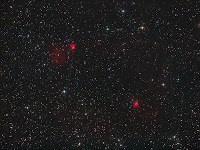 The group comprises of Sh2-147, 148, 149, 152 & 153 the two brighter components being 152 & 148 (Sh2-152 at top). The very faint Sh2-147 is just detectable at lower right. They are all components of the same giant molecular cloud. It made a welcome change to obtain a good set of subs without any problems. Details: 10" f4.3 Newt. 15 x 8 minute exposures @ iso1600 with CLS in DSS, FIV, CS2 & XAT.